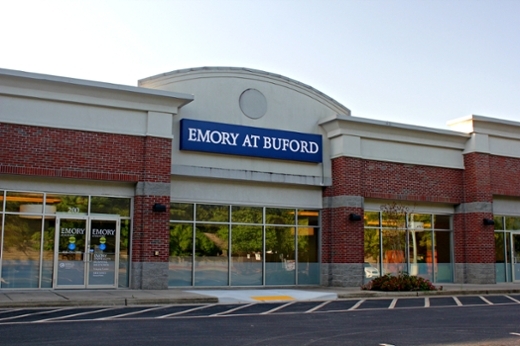 Emory at Buford-Primary Care, located at 3276 Buford Drive. The new Emory at Buford-Primary Care clinic, located at 3276 Buford Drive, is expanding its services less than a year from opening. Emory Healthcare leased 15,000 square feet on the second floor of Emory Center, across from the Mall of Georgia. It initially opened with Emory at Buford–Primary Care. Internist Timothy Richard Flynn, MD, who has practiced in the northeast metro Atlanta area for 20 years, joined Emory to help launch the practice in October 2015. Joining Flynn is Emory Heart and Vascular Center general cardiologist Renato Santos, MD. Santos is board certified in internal medicine, cardiology and interventional cardiology. The Emory University Hospital Midtown Imaging Center has also been added at the Buford clinic. The imaging center performs MRIs, CT scans and X-rays. Its newest offering is a wide bore magnetic resonance imaging (MRI) machine, which can be a plus for patients who have difficulties with small spaces. It’s also helpful in imaging larger patients. Operating hours for Emory at Buford are 8:30 am to 5 pm, Monday through Friday. For more information, call 404-778-7777 or visit the Emory Healthcare web site.